The region of the near infrared spectrum extends from about 700 nm (14,000 cm-1) near the end of the visible region, to 2500 nm (4,000 cm-1), which is the beginning of the infrared fundamental region. 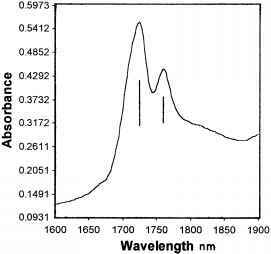 The HF molecule, for example, has its fundamental absorption band at 3962 cm-1. 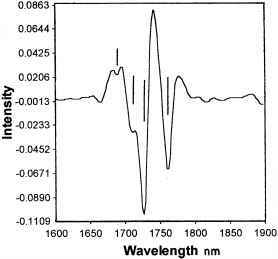 The near infrared spectrum of water is shown in Fig. 12. The near infrared region is populated with overtone and combination bands of lower frequency fundamentals below 4,000 cm-1. These bands are considerably weaker in intensity than fundamental bands. 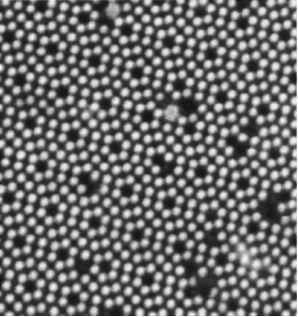 The intensity weakness is an advantage for quantitative analyses, particularly in production processing, because the larger cell thicknesses used can be better controlled, yielding more reproducia-ble intensity measurements. The cells can be made with water-insoluable quartz or saphire windows for example, which if they are thin enough, can transmit down to about 3000 cm-1. On the negative side, the qualitative information is considerably less extensive than in the fundamental region, as most of the near infrared bands involve summation bands (overtones and combination bands) of CH, OH, and NH stretching vibrations. Binary summation bands are usually the most intense, with tertiary and higher summation bands being progressively weaker. Even so, there is still some useful information to be had about functional groups. Characteristic group frequency charts and tables of these group summation bands can be found in the literature. A very brief selection of these are shown in Table III to serve as some examples. 2 x =CH2 asym. str. =CH str. + C=C str. b Varies with changes in hydrogen bonding. can be seen in Fig. 13. The overtones of the CH2 group out-of-phase and in-phase stretch bands show clearly at 1723 and 1758 nm. However, the expected weaker bands for the CH3 out-of-phase stretch overtone and the =CH stretch overtone, which are expected below 1723 nm, are so broad and weak that they are hard to detect. FIGURE 12 The near infrared spectrum of water run in a0.1-mm cell with bands at 1450 nm (2 x H2O stretch) and 1950 nm (H2O stretch + bend). FIGURE 13 The near infrared spectrum of oleic acid run in a 1-mm cell with bands at 1723 nm (2x CH2 out-of-phase stretch) and 1758 nm (2x CH2 in-phase stretch). 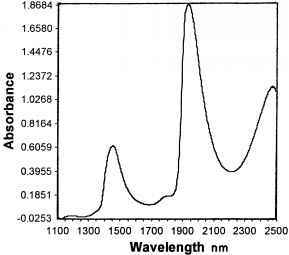 FIGURE 14 The second derivative of the near infrared of oleic acid (Fig. 13). Strong bands are seen at 1726 and 1761 nm (2x CH2 stretch) as seen in Fig. 13 but with bands pointing down. Bands not seen easily in Fig. 13 are seen here at 1711 nm (2x CH3 out-of-phase stretch) for the terminal CH3 and 1688 nm (2x —CH stretch) for the internal unsaturation. Negative side lobes on the sides of the strong bands are seen pointing up. resolved, and the weak CH3 and =CH overtone bands are clearly seen at 1711 and 1688 cm-1, respectively. The second derivative of a typical band has a strong central peak, but it also has a weaker negative side lobe on both sides of the main band that complicates the presentation. However, the advantages are that it gives narrower bands that improve the resolution, it brings out weaker bands, and it also straightens out the background.